Politics is a profession based on favors. Do me a favor now, and I'll return the favor later. During the 2009 Atlanta mayoral election, Congressman Hank Johnson endorsed Kasim Reed's campaign [Associated Press (2009-10-19). Johnson Endorses Kasim Reed. AM 750 WSB. Retrieved on 2010-1-17.]. Saturday, Mayor Reed returned the favor with a pledge to support Congressman Johnson in his re-election bid this year. 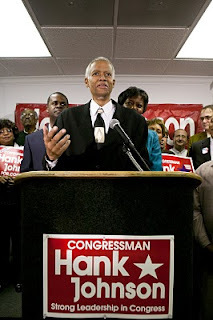 Before a crowd of 200, including many labor leaders and local elected officials, Hank Johnson announced his campaign for a third term in the U.S. House of Representatives. "When you sent me to Congress in 2006, I promised I would provide representation that would make you proud," Johnson told 200 supporters in attendance. I promised I would deliver for this district – and I have." Citing more than $200 million in federal funds invested in the Fourth District, his rapid rise to a position in the House leadership and the chairmanship of a Judiciary subcommittee, and a legislative record that includes multiple bills signed into law, Congressman Johnson affirmed that he would run on his record. "This race is about one thing," said Johnson. "Who can continue to deliver results for the people of the Fourth District? With that as the standard, I am more than confident we will prevail." Johnson faces two opponents in the July Democratic primary; DeKalb County Commissioner Connie Stokes and former DeKalb County CEO Vernon Jones.